Both of these cookbooks by Tanya Barnard and Sarah Kramer are good for regular folks that just want to make a healthy, compasionate little something to eat for lunch or dinner. So many vegan/vegetarian cookbooks call for essence of this or fresh herb something or other imported from Japan which really makes it hard to cook some regular food for someone who is not a chef. I wasn’t good at cooking food before I became vegetarian so it isn’t like I would magically be great (or committed to spending hours in the kitchen) after I eliminated a whole host of ingredients. Both books call for easy ingredients and simple directions. I especially love the recipes where they note that they can be frozen and reheated later. I have such a hard time cooking good healthy food while working and going to school, but this book is full of recipes that let you do that especially if you can freeze them and eat them later! Plus, the authors seem to have great laid back personalities. Not too “ooh-la-la” — very down to earth. They may try to be a little too cool sometimes, but it is better than someone who takes themselves oh-so-seriously as a chef. These recipes are great for anyone who is looking to eat more healthily. Downside of the book is that there aren’t pictures of the food and sometimes I can’t quite tell what it is that the recipe is for (like Jessie’s Cuban Sensation– very nice title, but what is it?). How It All Vegan has more basic recipes and the The Garden of Vegan expands your range of foods. They also have great ideas for parties, make-it-yourself products for the home and a special section for college students trying to be vegan in a dorm. How it All Vegan also has a helpful section for those who are used to more traditional cooking. It goes over what to stock in a vegan kitchen and helps one learn how to get a feel for vegan cooking. What to use in place of eggs? Soy milk or rice milk? What about cheese replacement? Speaking of cheese, one thing that lacks in these books, and I really think many vegan cookbooks, is this whole thing where they write “top with vegan parmesan cheese.” Oh really? That easy, is it? As far as I can tell, vegan land still lacks convincing replacement for most cheeses. The vegan cheeses I’ve found here in Cambridge, MA are not edible and my guess is that Cambridge has a relatively good selection of alternative food options. Store bought vegan cheese does not resemble cheese taste or texture to me AT ALL nor to my lovely partner who is much less picky than I am. The best thing I have found for cheese replacement is nutritional yeast. It actually has a cheesy taste and semi-cheese-like texture. But that’s for another post. So enjoy these two books. They helped me move past pasta as my main food. 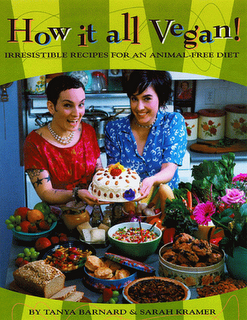 This entry was posted on Tuesday, August 1st, 2006 at 10:37 pm and is filed under book review, veganism. You can follow any responses to this entry through the RSS 2.0 feed. You can leave a response, or trackback from your own site. Have you tried tempeh? I began experimenting with it after having an incredible tempeh burger at my daughter’s house, and it immediately became a staple in my diet. Very tasty (nutty, mushroomy), easy to prepare in lots of ways, and loaded with protein. Annie and my wife seem to like rice cheese (except the “American” flavor). I don’t. Thanks, Elizabeth! You’ve answered my question about what to get Vicky for an anniversary present, which I had just been thinking about earlier today (the 29th is closing in). I’ve ordered both books from Amazon. Although not great, “Follow Your Heart” brand vegan cheese isn’t bad. It’s one of the few truly vegan cheeses – maybe the only one – that melts (kind of). In my opinion, its mozzarella is very close in texture and taste to fresh mozzarella, and it’s good in salads. Although I haven’t seen it, I’ve heard good things about Joanne Stepaniak’s “The Un-Cheese Cookbook.” Her “Vegan Vittles” is a treasure – that’s where we discovered some amazing qualities (like making delicious gravy!) of the nutritional yeast that you mention. At two Landmark movie theaters I’ve seen it offered as a free condiment to shake on your popcorn to give it a cheesy flavor. Looking forward to your future post about it. Jeff, I’d like to have the tempeh burger recipe that you mention. If convenient, please send it to me at charlie_talbert@yahoo.com.